TMJ stands for the temporomandibular joint. TMJ syndrome or TMD is a common pain disorder of this particular joint. 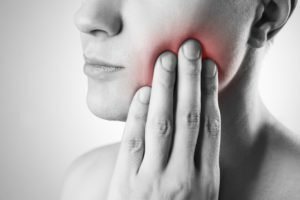 The TMJ connects the lower jaw to the skull and is responsible for all of the complex motions the jaw makes. It allows for smooth movement and basic functions like chewing, grinding, yawning, speaking and basically any other function that requires moving the jaw. There are many ways this joint can be damaged, but one of the most common causes is teeth grinding and clenching. The chronic form of this condition is known as bruxism, which is a typical precursor to TMJ syndrome. If bruxism goes untreated, it can easily allow the disorder to develop. TMJ syndrome can also develop after an injury, a misalignment of the teeth or jaw, poor posture, stress, arthritis and even chewing gum too often. All of these causes put undue stress on the TMJ and can cause permanent damage if left untreated. After receiving a thorough examination and learning about your symptoms, the dentist will provide a diagnosis and create a treatment plan that best meets your needs. One treatment for TMJ syndrome includes a dental splint, which is a dental appliance designed to keep teeth aligned and prevent teeth grinding. This is the most common treatment provided by dentists because they have the tools and expertise to protect teeth and reduce the symptoms associated with the disorder. The appliance is custom-made to fit your teeth exactly, so you don’t have to worry about it feeling comfortable as you sleep. Are you suffering from symptoms of TMJ syndrome? Schedule an appointment today to get diagnosed by a dentist in Waco! Dr. Rick Cofer earned his DDS degree from the Baylor School of Dentistry. He’s fully qualified to diagnose and provide treatment for TMJ syndrome, regardless of when it’s discovered. To learn more about his dental appliances or practice, you can contact him through his website. by: Dr. Rick Cofer at November 20, 2018 .